Its been a while once again, but we’ve been kept busy as usual. We have had a mixed bag as usual. Tough we have come across more and more is problems with Transom closers on Aluminium doors often found in communal doors and shops. They are basically a hidden door closer that is fitted above the door. Hidden it the transom of the frame. The units job is to allow the door to close behind you in a controlled manor. Not to hard as it can cause damage to the door, but most importantly it does not injure people, by trapping fingers or slamming into them. Many of of these units go un-noticed that there is an issue with them. As they are out of view and people are not aware they are there. One of the main ways to tell of an issue is that a black oily residue that is leaking down the door or frame. Running from the top. Another sign is the door will just slam shut with quite force, often banging and crashing. 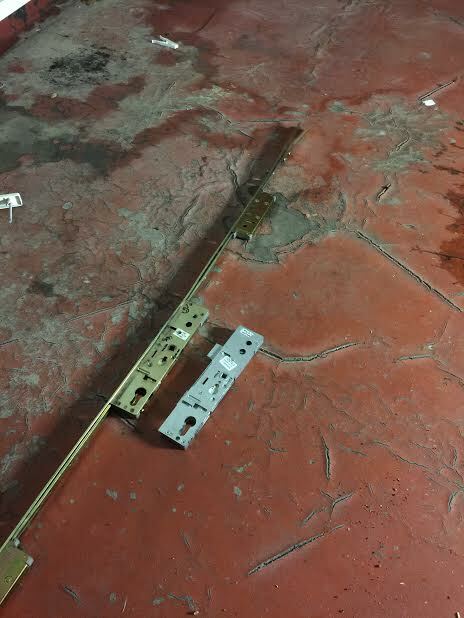 Sometimes the closing speed and latching sped can be adjusted to eradicate the slamming but if people have adjusted these closers then often the damage is irreversible as the oil has leaked and knackered the unit. With that the best bet is to replace the whole transom closer. We can supply them, instal them and maintain them. Once installed the difference is instantly noticeable. Many of our customers are amazed at how the door closes compared to the rough banging and crashing it was before our attendance. Doors typically would take around 5-8 seconds to close. Until the last 10 degrees where the door needs a extra push to latch the door to ensure it closes properly. So you should get a nice secure close with the confidence that the door will lock each and every time. 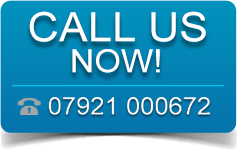 Please just call us on 07921 000 672 to speak with us or obtain a quote in a replacement. We can also replace the arms that are fitted to the doors. Whether they are side loading or end loading. We can also replace the floor pivots that the door sits on. Sometimes these are forgotten and missed. We also advise that new parts are replaced and once a year that the units are checked to ensure there is no leaks, or nuts, bolts or screws have worked loose. We will also make any necessary adjustments that are required. This entry was posted in Uncategorized on April 11, 2016 by Paul Horton. Thought i’d take a moment to do a small blog, as not getting round to doing them as often as i’d like. We as usual have been flat out with work. More so with our HMO’s and hostels. We have also had a lot of enquiries in regards to key cutting. We have been getting a lot of calls regarding the Brisant range of keys. Especially the Ultion range. We are able to cut these if we have the physical key to hand. However we are hoping soon to have the ability to cut these to code. So our customers can ring us, or go on to our website and input the code and we will receive email with the requirements. We can then either post out to you, or we can deliver them to you. We hab]ve the ability to cut most keys. From mortice keys (Chubb type), cylinder keys (Yale type), Lazer keys typically associated with cars. Although we don’t deal with a huge rang of car keys we can cut a few. Dimple Keys, these are becoming more and more popular. 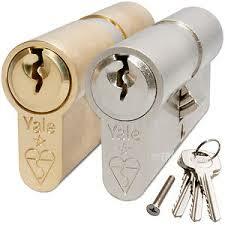 They are keys that enter the lock horizontally and have dimple cut into the lock. Please call us on 07921 000 672 with any queries or questions you may have. 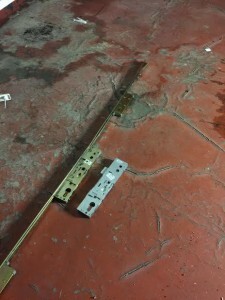 We do also cut a selection of keys on-site at jobs. The added bonus of this is it allows you to try the keys before you pay for them to ensure a perfect copy has been created. Nothing worse then buying keys then getting home to find they don’t work. This entry was posted in Uncategorized on March 12, 2016 by Paul Horton. Thought I’d get on and post a blog as its been a while. Even so we have been ever so busy and building up the business. We have been going from strength to strength. The shop is doing well and gaining more and more returning business. The other local businesses are using us and we have built up a nice little community there. We recently had the new vans sign written which was extremely exciting. We are extremely happy with the works carried out. We have had plenty of positive reviews from people. We’ve had as usual, a varied work load. From installing Master Systems, for a local authority. Then we got a landlord who had been referred to us who had made one of his properties into a HMO, House of Multiple Occupancy. He wanted us to install a master system set up that none of the tenants could copy the keys. The reason being that they then could not get keys copied and give them out to friends. We went and visited the guy, and and he told us what he was looking for. We were able to explain the benefits and the possibilities that we could create. They guy was extremely impressed with our knowledge and experience. We were able to prove our works by showing him our portfolio of previous works. We also had samples of the locks we use. The landlord was now sold on the set up purely on the fact of the benefits it would bring him and the management of the system once installed. The fact he and his other partners could access the property all with one key. Though all the tenants keys would only open the communal door and their room. The works were agreed and we agreed a day to attend and carry out the works. On that day we arrived in Kidbrooke and within 5 hours the job was completed and the keys handed over. We went through with the landlord and he put his master key on his car key. He then proceeded to walk from one room to the next just using his key. He had this cheeky grin on his face. You could see the relief on his face. When it came to time for leaving he asked if we could do his other properties. We agreed we could and again told him they do could all be built to work on that one key. On that basis we are now attending on Wednesday to look at a 13 room hostel he owns that we need to convert for him. This entry was posted in Locksmithing, Uncategorized on February 14, 2016 by Paul Horton. Christmas almost upon us again. It almost seems if it was this time last year we was prepping for it HA HA. Well now the evictions have quietened down, due to the 2 week amnesty, that takes place with the court bailiffs. Though our other forms of work still goes on, and we are as busy as ever. Though today we had an interesting job. One that we have not had before, which was a Local company that had just taken over a new premises. The problem being that they did not get the new keys to the parking bollards. So with the removal company needing access to the car park, and to get as close to the building as possible.. The business owner Steve asked if we were able to attend to open them ASAP. 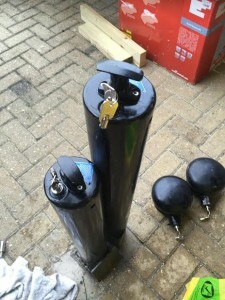 Also replace the locks so that they could continue to use the posts. As it would be likely people would park or use the car park as social gathering place. Or to avoid paying for parking. We arrived on site at the prearranged time and met Steve. He was a really pleasant guy and and offered us a drink etc. So Steve walked us to where the posts were, and they were not was I was typically expecting. I was expecting a fold down post with a padlock. Though these were not. Theses post were about 5” in diameter and had a cap on the top. Which reminded me of like a muffin top. On the front of what I call the muffin top was a tubular extension which housed a radial cylinder. The type of lock you’d expect to find in a vending machine or a bicycle D lock. The key is effectively like a tube with 7-8 or 10 pins. You push the key in and this depressed the pins to their required height and when set the key will rotate. So I set to work opening these locks. They were a little tricky to open but after about 15mins I had managed to rotate the plug of the first one and the lock pops out about 25mm. Now at this point I expected that the post lifted out of the ground. This wasn’t the case. All that happened was that the cap or Muffin top came off. 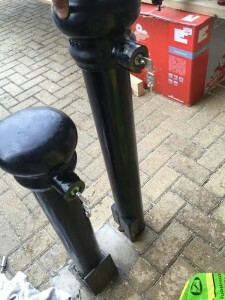 Which then left the post with another lock the same as the other and a handle. The handle was solid so it was obviously a case of when you opened the second lock, the handle would rotate. Then the post would be pulled out of the ground. So I set to work on the second lock. Soon it was open. It popped up from its housing. A turn of the handle and sure as hell the post was free from the ground. So now I moved on to the other posts and they were opened quickly. So with that we rang our supplier who stocked them so we was able to get them and go back and re-fit the new locks to all the posts and the caps. Steve tried all the posts and was kind of excited that he could just have one key on his keys that would allow him to open all the post. With that complete, Steve asked us to look at the other locks on the premises and with that he then decided to replace them all also. He then had the whole premises put on to one key also. So now he was down to just 4 keys on his key ring. 1 for the posts. 1 for the locks to the whole premises, 1 ket to his car and finally a key to his front door at home. So in all, an interesting day in the life of a locksmith. Just one of the many jobs that we can come up against. Not just all people locked out all the time. Steve was extremely happy with our service, and did say he had read our reviews on Checkatrade.com also. Giving him peace of mind with regards choosing the right Locksmith, to carry out the works. This entry was posted in Uncategorized on December 17, 2015 by Paul Horton. Eviction Locksmiths is a specialist job in our opinion. It can be an intense situation requiring patience, a thick skin and the ability to work under pressure. Lately we have had to carry out a fair few evictions and forfeiture of leases. They are not the nicest of jobs in some cases but sadly they are a necessary evil. Everyone needs a home and should be entitled to a home. However sadly we have many people living on the streets still. Everywhere we go lately in London you will find new properties being built. Though these will go to investors abroad, landlords will buy up with intention to use as a source of income. However many rental properties will have to go through the courts to get the possession back for the landlord. For a few reasons the tenants will not pay the rent to the landlord or managing agent. Whether that be because they have fallen into financial hardship due to loosing their job, or become ill and unable to work. Or simply their circumstances have changed. They will not be able to pay their rent and will fall into arrears. Now as they are not paying, the landlord will have to subsidise the mortgage. In order for them not to fall behind with the mortgage. They will then have to start the proceedings to get their property back. They have a few ways to get it back but the last resort is through the courts. They can speak with the tenants in order to see if they can resolve the issue. Get the arrears paid or the tenant agrees to leave. This in at least 90% of the cases will be unsuccessful. The tenants will avoid contact, via calls, visits and letters. Some will keep in contact and later the relationship will turn sour. As tensions will run high. The tenants don’t want to loose their home and the Landlord wants their property back. So with that you tend to find that the tenants will then try everything to make things awkward and pro-long the situation. Not all but a large percentage. The process normally starts when 2-3 months worth of rent has not been paid. A protocol has to be followed with notices and letters sent to the tenants. More information can be found HERE Then it can be heard by a judge who will decide if repossession/ eviction can take place. If they rule in favour of the Landlord then the Court Bailiffs will attend site and ourselves as the eviction locksmiths to gain entry if need be. The bailiffs will have the warrant with them. Some will have already packed and left, others will be there still packing. We get situations where the tenant will not be at home, they maybe at work or shopping etc. They don’t believe anyone will enter the property. Other times we will attend the tenants will be there, and ready to go. You just can’t predict it, each one is different. Some tenants will be abusive towards you, making threats and get aggressive. Some will be embarrassed and say nothing and leave as soon as possible while others will be extremely polite and understanding that your just there to do a job. .
As Eviction Locksmiths we can attend evictions and do on a daily basis. Last year 2014 we carried out over 500, by the end of this year we are on way to possibly having completed 580. A mixture of Direct from landlords. Some indirectly from estate agents and managing agents. Whilst a large portion also comes from some of our housing associations that we work for. We have built up a good working relationship with all the local bailiffs Especially from Woolwich, Bromley and Dartford County Courts. The Bailiffs are always happy to see us as they know that they will be in the property promptly, without fuss or drama. The door will not be damaged by drilling or use of crowbars and the like. We carry all the stock required to secure the property. We won’t have to drive off to get stock. This entry was posted in Uncategorized on December 7, 2015 by Paul Horton. 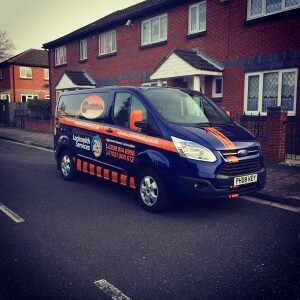 As an Emergency London Locksmiths service, we have had a few mad weeks Danny and myself. 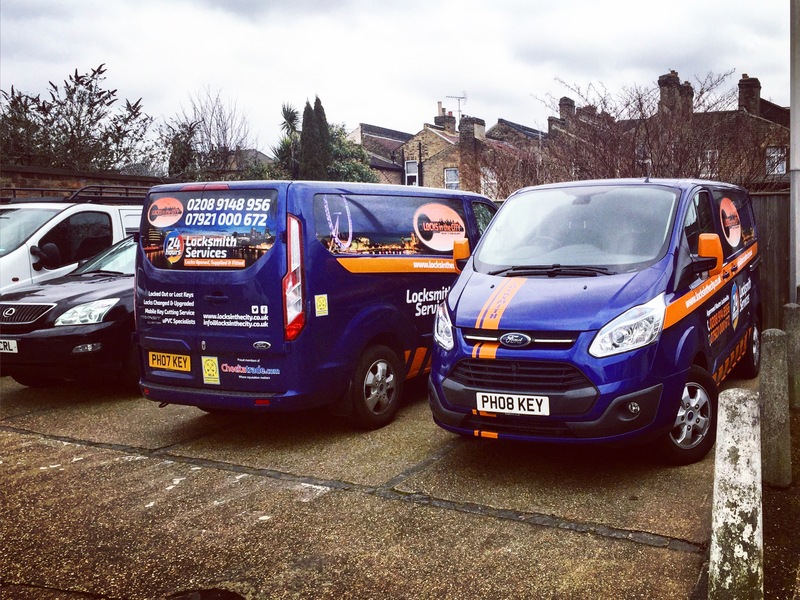 We recently purchased new vans which was a big investment for the business to help aid towards being the number one emergency London Locksmiths. We are extremely happy with them. The vans are our mobile offices, workshops as well as most importantly our transport. 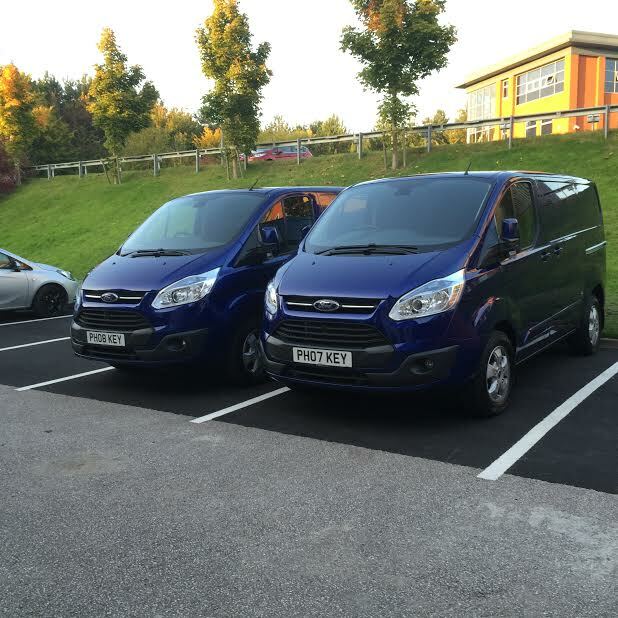 We decided to go for fully loaded Transit customs in the Performance blue. These are great vehicles. We are in the finishing stages of designing the signwritting. It is hopefully being put onto the vans midway through December when things quieten down. We have gone bold on the deign and as eye catching as possible. So watch this space as we will do a blog on the vans when done. We have put the private plates on them with both just one digit out from each other but both having the work KEY as the last 3 letters, so a fitting word to the world of locksmithing. So the business is doing extremely well and we are building a list of customers and businesses on a daily basis. 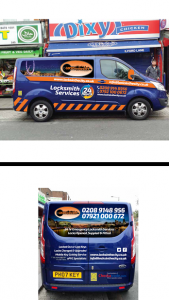 Being an Emergency London Locksmiths we want to show people that we are not a fly by night company. We are a genuine professional business. We have many returning customers, some use us more often then others. Thats because we believe we are the leading emergency London Locksmith. This week I had a customer who I did a job for in Woolwich SE18. We carried out the 3rd job for him within the last 2 weeks. The gentleman has a portfolio of properties in the local area, we attended one in Charlton and another in Blackheath. The customer has been really happy as initially they found us on Checkatrade after reading all our reviews. He said we wasn’t the top one at the time, though they liked our company image and our writing as well as the genuine reviews we have received. They did speak with competitors but they were quoting extortionate prices. We want the local work and to build up a trustworthy go to local Locksmith reputation. Which we seem to have done. So locally this week we have done a fair few upvc mechanisms, where the weather change has caused doors to expand. People will then force the doors shut and wrench the handles up to lock until one day it will completely fail. At this point if your lucky it will fail in the open position. If it fails in the locked position with the door closed then this makes opening a lot more awkward. So we always suggest you always call us when you discover an issue. We have had a fair amount of slam shuts, which in the locksmithing world is as technical as it sounds. Someone has just shut the door leaving the keys inside the property. So we will always attend and advise the customer that we will open their door non destructively. If we have to drill the lock then we will offer a free replacement. This entry was posted in Uncategorized on December 5, 2015 by Paul Horton. So with the darker evenings now upon us, its time to think of your Home Security. To ensure you’ve protected you and your home as best you can. As you are more likely to get burgled between now and Christmas. Why ? well burglars love the cover of darkness. Not only that, but burglars know we will be all buying gifts for our loved ones. The average gift being around £50-£100 you are most likely going to have a couple hundred pounds worth of gifts. Phones, iPads, TV’s, Jewellery, Designer clothing. So an ideal time for them to get high value items that are still boxed. That will be sold on for silly money compared to the prices that you paid for them goods. These people are ruthless and will rip open presents that are wrapped. They will reek havoc and not care for a moment. So there is a few things you can do to protect your home security and make it less likely to be a target. Locks in the City, carry out many home security surveys, weekly. Firstly and most importantly DONT MAKE YOURSELF A TARGET. Dont advertise you have expensive gifts. It’s so easy to advertise on Facebook, Twitter, Instagram etc. All social media is dangerous. As it doesn’t necessarily just go out to people you class as friends, it can be seen by anyone in the world if your security settings are not set. You may have people who you have met once or twice but you don’t necessarily know or can trust. They could be passing info on. Be weary. Photos of bags, is dangerous as it advertises where you’ve been shopping. Telling people that your off shopping is another advert your home will be empty for a couple hours. These people need minutes so think before posting. Secondly before you go out ensure you have secured your property. Lock your windows, hide the keys. Lock your other doors, many people still lock the door but leave the key in the door. If they get in through a small window, then they can open the door and walk out off loading the big items with ease out of the door. Lock it and hide the keys, where they are least likely to be found. If doors and windows have additional locking points and devices then use them. If they are going to get in, then you want to make it as hard as possible. The more resistance and noisy the better, they will more then likely walk away. Also if you have a Christmas tree up then either put it out of view, of all windows and view points where possible. If they look through a window, or are walking past and see a tree. They then look in, presents are in view its like showing a child sweets. The decorations won’t be the only thing lighting up !!!!!!. if the tree can’t be put out of view then don’t put the presents under the tree. Put them in the loft if you have one. High value items hide away, in places where they wouldn’t usually go. Kitchens, bathrooms, hidden cubby holes. These people will usually riffle through high value rooms/ spaces. Bedrooms, living rooms, garages etc.These people will go through chest of drawers, wardrobes, bedside cabinets. We advise you look at installing a safe to store your high end goods such as watches, jewellery, iPads and documents. We can help select and instal the right safe for you. One issue we have come across is people buying digital safes but not securing them down. So the burglars will just carry them away and open up after. If your planning on going away during the day and evenings look at purchasing a Response Fake TV. It gives the impression of a TV flickering light, an unpredictable pattern of flashing light. Also if your away for a night or so try have a neighbour keep an eye out. If your friendly enough and trust your neighbours ask them to pop in and turn on and off different lights. Park their car on your drive etc. Also invest in External L.E.D Flood lights with P.I.R sensors. These will pick up people walking up to your property, flooding the area with light. The L.E.D ones you can get now are relatively cheap now and are low wattage and power consumption compared to the old halogen ones. Fitting these in dark areas will also add as a visual deterrent. Also securing side gates, fitting locks that require keys or coded padlocks. Simple slide bolts can just be opened. Secure fences and repair any hole or broken panels. Look at creating high fencing by adding trellis, to make it more awkward and a less of a deterrent. Store and secure ladders and tools away that can be used to aid in gaining entry into your property. Anything that can be used to stand on to climb through windows etc move away. One other crucial thing that will help is to install an alarm. Many people have them installed but fail to use them. Using your alarm will benefit you hugely. As the alarms today are more reliable, more advanced with options that people don’t realise are available. We supply and fit alarms often. Sadly though we fit them to properties after they have been burgled. We will come out and do a survey on your property, we will look at areas that are vulnerable. Best advise where to put sensors whether its a motion sensor or a window and door sensor. We will create a bespoke set up for each individual property for each and every customer for their home security . We supply alarms that are smart. These alarms can be installed relatively quickly as they are wireless apart from one power lead and a phone line. Once installed the alarm if triggered will call you !!!! not an alarm monitoring centre. It cuts out the middle man and keeps you in control. The alarm when triggered can call 3 telephone numbers. It will ring one number, if no one does then it will ring the next one. It will cycle through the numbers until the call is accepted and acknowledged. We can also eliminate the need to type in codes to arm and disarm the alarm. We can supply remote controls that you can put on your keys. Keep in your pocket etc. Then the press of a button arm or disarm your alarm. If you away from home and you can’t remember if you set alarm !!! no issue you can ring into the alarm system and check its status, arm, disarm or even set to home mode. For more info contact us regarding your home security. Another popular addition is CCTV, its getting cheaper as an option now. the cameras are getting smaller and the quality higher. You can buy DVR’s that store 100’s of hours of footage. Apps that allow you to remotely view your cameras on your smart phone or tablet. So you can always check in. These are also getting cheaper to buy and are a great visual deterrent. 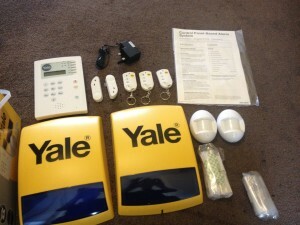 Again contact us for more info or queries, regarding your home security. We can attend your property at a pre-arranged time to suit you. Carry out a free survey and home security check and point out any areas of concern. We can then carry out the works if agreed swiftly at a time thats convenient to you. So be prepared and don’t have your Christmas spoiled. On that note, we at Locks in the City would like to wish everyone a Merry Christmas and a Happy New Year. 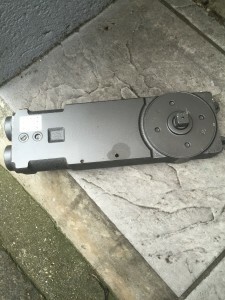 This entry was posted in Home Security on December 1, 2015 by Paul Horton. Well as Locks in the City is an approved company of the MLA, we always try attend all MLA meetings, training where possible and expos. The expos take place every two years. So this year it took place 2nd,3rd and 4th of October in Telford. These are always good to attend for numerous reasons, one to meet other like minded individuals. Two to socialise and mix with other members of the MLA and suppliers and exhibitors. Seeing new tools in action that are coming to market, as well picking up stock to replenish what we have used. Some great deals were to be had. Many of the big suppliers were in attendance exhibiting, though sadly most seemed to be demo’ing key machines. I drove up on the Thursday afternoon, it was almost like a mini break away. I met up with fellow locksmith and friend Aspects Locksmiths from Bridlington. We met up at the hotel at around 9pm. We checked in and then catches up for some dinner and a well deserved beer. It was then off to bed at 11:30pm so that we were up fresh to attend the exhibition for 10am. So we arrived at the exhibition centre for 09:30 and went got our badges. I had a few machines, and items to sell on the bring and buy sale. So we attended the stall and set up and manned the stall for hour or so. Other people had bought tools and stock to sell. So there was a mixed bag of stuff from safe scopes, locks and my key machines. It was interesting being behind a stall and watching people passing and browsing. I found it interesting to people watch and see them stop, stare and pick up stuff to examine or even barter. It was also interesting to stop and look at name badges to put faces to names of people you see regularly on forums etc. The first day was ok and we sold x1 of the key machines to a fellow locksmith I know from the forums. I went to one of my preferred suppliers who was on the next stall to us and purchased a large amount of stock. Mainly cylinders and gearboxes for upvc doors. Also few handle and other odds and ends. Then off for a scout about and catch up with some of the other suppliers we deal with. The expo ended at 5pm so it was back to the hotel to have a few beers and chill out and rest the worn out legs and feet as you are on them all day and do walk a fair milage. Might invest in a pedometer next time to see what you actually cover in steps. We’d all planned to go out into iron bridge to go for a meal and see some of the nightlife. We went to a pub and had a great meal and chat between ourselves. Talking about funny jobs and worst jobs that stuck in our minds. Also sharing tips between ourselves. We then walked down to a busy looking pub and once in there we bumped into a few other fellow locksmiths who had the same idea as us. It was a good night and we all had a laugh and then all headed back to the hotels by cab which took a while. Saturday morning and it was up bright and early to go for breakfast and take in some fuel for the day. A lovely full english and couple cups of tea. We then made way to expo again another lovely day sun out and shinning. We collected a new badge for the day and then made way to the bring and buy stall to set it up again ready for the day. We prepped the stall and some bits sold fairly quickly as Saturday seemed to be the day most of the locksmiths attended or people related to the trade. Fair amount of interest in the machines and another two were sold. We also purchased some deadlocks there put there to be sold. Jeff Turner was on the stall also so we had a good chat and laugh as Jeff is quite the comedian as well as great locksmith. I could spend all day with him learning. Danny my business partner arrived after driving up for the expo so another comedian was on the scene. We went had a scout about to purchase stock for our shop and vans. As we also had our new vans that we had only collected on the wednesday. We found a company locally who would rack out the back of the vans as well as lay a ply floor also. The company was only a few miles away which was handy. They agreed we could drop the vans in and they would do both. So Kinder followed us down and we left vans there headed back to the expo after stopping off for a daily dose of redbull. We all had a scout about picked up some other bits that some of suppliers had put out that wasn’t out on Friday. Then back to the stall where some items had been sold so we had a rearrange and adjust some of the pricing to see if that helped shift the remaining items. The expo again ended at 5pm and as we had collected our vans earlier in the day as after 2.5 hours they were ready. When we got there we was really impressed with the workmanship and the quality of the units in the van. 18mm ply and all bolted in and all joints tenon joints so no fear of it rattling to pieces. So back to the hotel where we had couple beers and some light snacks before going to get ready to head out into town for a curry. We ordered 3 cabs to take us into Shrewsbury. We went to a nice bar where it was packed with people watching the rugby. We had a couple drinks and walked down to another pub that was a little quieter. We was all able to mingle and chat and have a laugh. We then all worked down to the curry house that Simon rated highly. We went there and on arrival we were all welcomed and taken to our seats and offered a drink whilst looking through the menu. The food in this place was amazing and everyone ate there meals and nothing went to waste. Definitely a place i’d go back to. We were there until 12am and then all jumped in taxis back to the hotel. Off to bed we all went knowing it would be another early morning prepping for the last day of the expo. 8:30 it was down to reception for our last breakfast. We all had a good old fry up and tea, coffee and fruit juices to prep ourselves for another long day ahead. Danny had to drive back home for commitments. Myself and Kinder headed back to the show and prepped the bring and buy stall for the last day. I sold one of the main machines I was hoping to sell to another fellow locksmiths who is held in high regard. The last day was spent on the stall and talking to other fellow locksmiths new and old. The expo was to end at 3pm on the Sunday. So about 2pm we started to prepare to leave by collecting our stock and parts and loading in to the vans. We had a final walk around and said our goodbyes. Now back in the van and start the long journey home expected to be 3-4 hours traffic dependant. In all it was a good weekend and fun had by all if not a little expensive but in this trade you need that time away. Now above may sound a little boring, but you live for weekends like that. Where you can socialise, eat and drink and not put your life on call for 24 hours. This entry was posted in Uncategorized on November 5, 2015 by Paul Horton. Locks in the City, gains a new Locksmith. Sorry its been a while since my last post but it has been hectic here in the world of locksmithing. We have had a few changes since last post. Starting with acquiring a shop in Dagenham, Essex. It all started by accident in January of this year. Another Locksmith Danny, went to a friends new shop which was opening as an estate agents on a parade of shops. Danny went there to change his locks. Whilst there the agent told Danny that the shop next door but one was vacant and was at one point a locksmith shop. Specialising more in auto stuff, but did do domestic and commercial work in small amounts. Danny agreed to go have a look when the keys were available. Later on I spoke with Danny and he had told me about going to look out of interest to see if there was any machinery, tools etc etc. I was intrigued too. So said I’d go look at same time. I’d never wanted the responsibility of a shop, due to the overheads, parking, and staffing. So we went for a nose and the shop was stripped bare. Just odd key blank and a door ring pull. Though all the counter and shelving remained. The Agent said how much it was to rent and that no business rates applied and bills were a minimum. You could park outside shop and then general parking was unreal. No restrictions and ample of it. We left the shop and went into the agents to have a general chat. He then turned to Danny and me and said so you’s two thinking of taking on the shop then. I just laughed and said oh yeah we will be taking over a certain chain of so called locksmiths that operate now out of some supermarkets. We left and went our separate ways and it was in the back of my mind that the shop was already on the map as it were as a locksmith shop. So a base had already been started. More and more I thought about it. Then Danny rang and we spoke about it and both had said similar things. We both felt we wanted a base for storage and that and felt it was worth a punt. We liaised back and fourth and a 6 month trial was agreed to test the water. We’d agreed to take shop on. We then proceeded to start work on the shop and continue our working days. After a month or so me and Danny spoke about names for the shop and we came up with 100’s. Though nothing was quite fitting enough. We trawled the internet, etc to come up with clever names but nothing really fitted. Then one day I was sitting there and thought it would be complex trying to run effectively x2 businesses. One was hard enough. I spoke with Danny and put the idea to him. We spoke it over for an hour or so and then we agreed it would be simpler to combine and merge together as one company. As I was already VAT registered and had just completed the Master Locksmith Association exams and gone down the route of becoming an Associated company, It made sense to then become Locks in the City. We made arrangements to go speak with my accountants and we spent an hour with them and went through the options. We then agreed to become a limited company and both become equal Directors. A lot of people were like you sure its the right thing to do etc. As a joint business can become an issue and each of the two could rub up against each other and create friction and arguments. Though its quite the opposite. We both have our strengths in different areas. Danny is the talker and the salesman and has a natural flair for networking. He knows his UPVC mechanisms and is also willing to work the hours required to make the business grow and work. Myself, I have the experience and knowledge in most aspects of the locksmithing world. I am able to turn my hands to al things and have an engineering mind and love solving problems. I have a lot of experience in Domestic and Commercial repos, evictions and forfeiture of leases. So neither of us steps on each others toes. Neither thinks one is better then the other. We accept there may be days, or weeks were one may do more jobs then the other but we understand that the end result is for both of us, as we both equal. So the incentive is there to strive and do as much as we can. If either is quite, then the other will go help on the jobs that need doing. So we are now in the process of having ordered 2 new vans and await there arrival hopefully within the week. Then the joys of getting them sign written and racked out etc. Its been a hard few months but we are starting to reap the rewards of hard work. This entry was posted in Uncategorized on September 10, 2015 by Paul Horton. A recent article in the Richmond & Twickenham Times reported on the theft of a delivery van in Hampton Wick at around noon on Friday 10th July 2015. During the incident, the thief drove the van at it’s driver in order to make off with the vehicle. 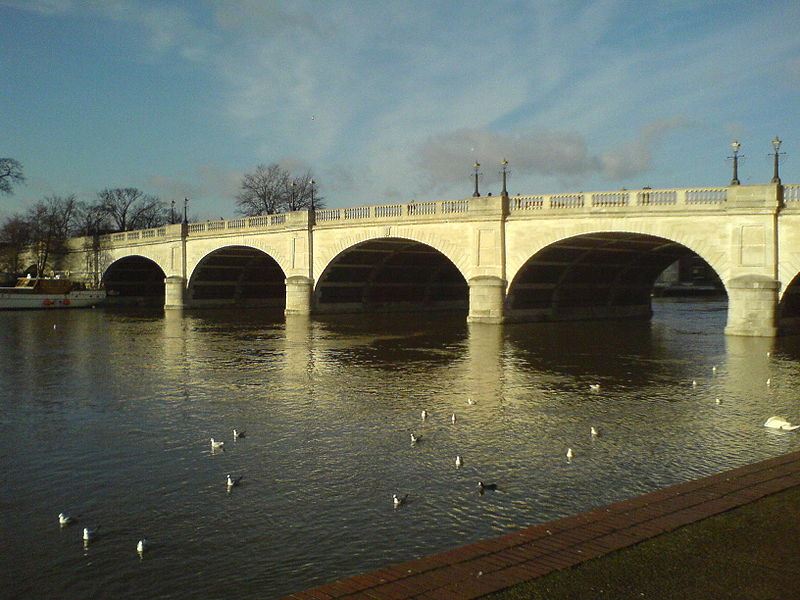 The van was seen driving in the direction of Kingston town centre and had been taken from Hampton Wick in Old Bridge Street. A witness to the crime saw the delivery driver try to block the escape route of the culprit by jumping into the bus lane on Kingston Bridge. The 49 year old victim was then knocked down. Following the incident, the delivery driver was taken to hospital and treated for minor injuries. To date, police have made no arrests in relation to the hit-and-run theft. If you have any information that could help the police with their enquiries however, please call the non-emergency police line on 101. Alternatively you can pass on information anonymously via Crimestoppers on 0800 555 111. If you would like any security advice for your business or home then please do not hesitate to contact us on 07921 000672. With thanks for the use of the photo of Kingston Bridge to Stephen Parnell. This entry was posted in Latest News and tagged van theft, vehicle security on August 12, 2015 by Paul Horton.